This afghan is knitted on circular needles, forming a cable every six rows. I have made several of these in a variety of colors for family members and am always pleased with the result. Basically, for seasoned knitters, with about 48 ounces of worsted weight yarn, cast on 230 stitches using size 10 1/2 circular needles, work a seed stitch for six rows and then begin knitting six stitches and purling six stitches across the row, maintaining four seed stitches on each side. Twisting a cable stitch on the knit stitches every sixth row, continue the same until desired length is reached, ending with six rows of seed stitch. Happy knitting ! It is beautiful and looks very, very cozy. Beautiful! I bet it keeps you warm too. Very pretty and I love that shade of blue. As you said, it makes a great gift and they'll think of your graciousness when they bundle up! but you must be very pleased with it. How very pretty and what a gorgeous shade of blue. What lucky recipients to get your afghans. Oh my goodness, that is beautiful!! 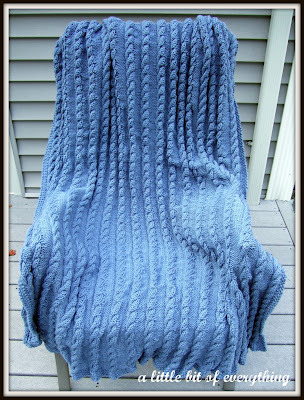 I hope when I get past knitting things like scarves, hats, and toys, I hope I will be ready to move on to this afghan! Love the shade of blue - beautiful pattern - inspiring! This is so beautiful! I love cable knit AND this is no exception! Stunning~! I can't imagine how long something like that would take me :-) It's beautiful! Visiting from FMBT already a following. Have a great day! Oh, and if you have time I’m in the top ten to win a block make-over! You can vote once a day until the 28th. I sure would appreciate it. Thank you so much! The button to click on is in my side bar. Thanks again! So pretty~ love that color!! So pretty! I wish I could do that!! Very nice! I wish I could make things like that. Very soon, I will attempt a baby quilt (yikes). Im a new Google Connect Friend following you from Buzz On By Thursday Blog Hop! Love if you'd follow me back. I am in awe of your talent. Thanks so much for linking up to Beyond the Picket Fence. What a beautiful work. 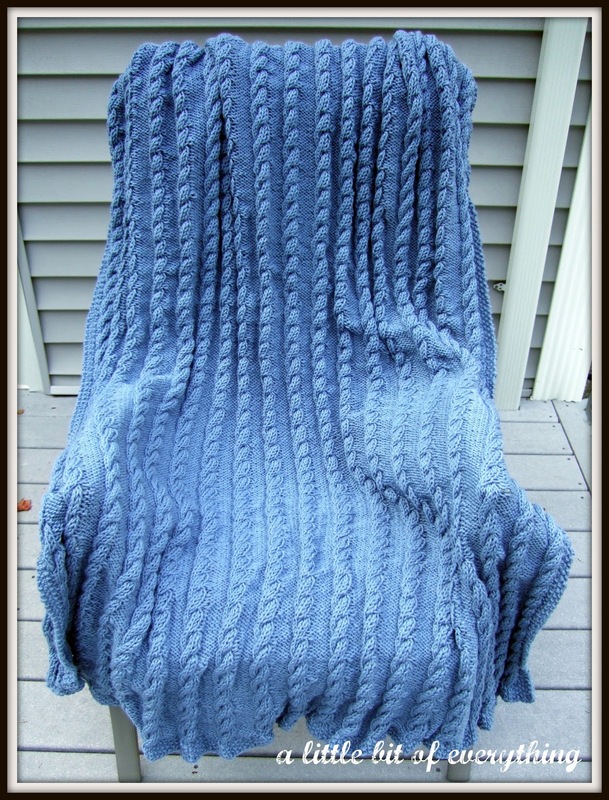 An afghan like this one would make a wonderful gift. So pretty and very warm too! It doesn't get better than that! I love snuggling up with a thick afghan when it's cold. And I really like cable knits. Yours is lovely.